(Compiled from articles by Mary Kay Linge, NY Post on Nov. 24 and Nov. 25) – The United States and Mexico appeared for a few hours Saturday to be on the brink of solving the ­crisis on their shared border — until an apparent last-minute retreat by the incoming Mexican government. Mexico’s president-elect, [who takes office on Saturday, Dec. 1] had agreed to a Trump-administration plan that would make Central American asylum-seekers stay on the Mexican side of the border while waiting to be legally admitted to the US…. The plan, called “Remain in Mexico,” had been negotiated last week by Secretary of State Mike Pompeo, Homeland Security Secretary Kirstjen Nielsen and other US officials during a meeting in Houston with reps of Mexican President-elect Andrés Manuel López Obrador, The Washington Post [reported Saturday]. But by Saturday night, Mexico’s incoming government was denying that any such plan had been finalized. The denial came hours after the Washington Post had quoted Sanchez saying that the plan had been agreed to as a “short-term solution.” She said, “The medium- and long-term solution is that people don’t migrate [from their countries through Mexico to the U.S.]. Mexico has open arms and everything, but imagine, one caravan after another after another, that would also be a problem for us.” She told the Post that “for now, we have agreed to this policy of ‘Remain in Mexico'”. The program was meant to end the “catch and release” system, long denounced by Trump, that allows migrants seeking refuge in the United States to live here for years as they wait for an immigration judge to rule on their applications — a practice that immigration officials see as a dangerous loophole that encourages illegal border crossings and contributes to years-long backups in the adjudication system. The number of asylum applications has exploded since 2014 as more migrants [are taught by liberal groups what to say and how to act to become eligible for asylum] to exploit the rule, which the Trump administration sees as a loophole encouraging illegal border crossings and straining the US immigration system. Many applicants, especially those with flimsy asylum claims, never appear for their court dates. And fewer than 10 percent of those who pass an initial interview are granted asylum. Mexico’s previous leaders have resisted American calls to halt the flow of Central American migrants through Mexican territory and have regarded the issue of illegal immigration through the U.S.-Mexico border as an American problem. López Obrador’s willingness to take on the burden of housing the migrants — perhaps for extended periods — was a surprising development, especially since he campaigned as a progressive [liberal] and has criticized Trump. Trump’s threats to shut down the southern border of the US — which would be a serious blow to the Mexican economy – and ordinary Mexicans’ growing anger at the constant flow of migrants helped to spur the deal, [which Mexico is now apparently going back on]. Nearly 5,000 Hondurans and Guatemalans who have been traveling in caravans for more than a month are camping at sports fields in the Mexican border city of Tijuana as they wait for interviews with US immigration officials. Tijuana residents have mount­ed protests and the city’s mayor has called for emergency help from the United Nations. 2. a) What agreement had the incoming Mexican government made with the U.S. Secretaries of State and Homeland Security, according to a report in the Washington Post? Be specific. b) How did president-elect Lopez Obardor’s government retract (go back on) their agreement? What did they say? 3. a) What is “catch-and-release” b) Why is it harmful and ineffective/ineffectual? 4. President-elect López Obrador’s agreeing to the plan was surprising, as he had campaigned as a progressive [liberal] and has criticized Trump. For what reasons did the reporter say he agreed to the “Remain in Mexico” plan? 5. 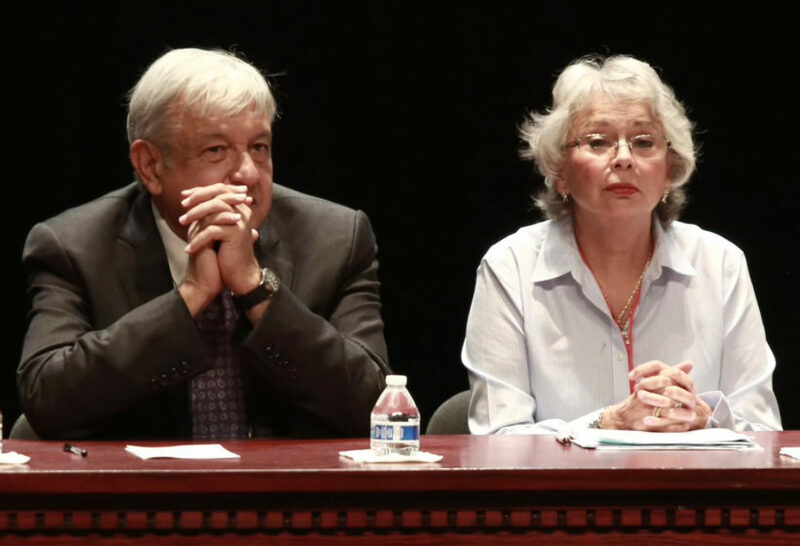 Why do you think Mr. Lopez Obrador’s incoming administration, after telling the Washington Post it had made the agreement with the U.S., has said no agreement was made? a) Do you agree or disagree with this assertion? “Would be very SMART if Mexico would stop the Caravans long before they get to our Southern Border, or if originating countries would not let them form (it is a way they get certain people out of their country and dump in U.S. No longer). Dems created this problem. No crossings!” Trump wrote on Twitter.